Dr. John H. Knight, Jr. DDS “Jay” grew up here in Charlottesville, Va. In 1960 his Dad John H. Knight, DDS graduated from the Medical College of Virginia (MCV). At that time Jay was 2 years old. His Dad and Mom, June Knight moved back to Charlottesville at which time he opened his dental practice. In 1977 Jay graduated from Albemarle High School in Charlottesville. This was the last year that all Albemarle County high school students were at the same high school. Dr. Knight attended Elon College in Burlington, North Carolina now called Elon University and graduated in 1982. After early careers in Hotel and Restaurant mangement and Real Estate Development. Dr. Knight attended The University of North Carolina School of Dentistry in Chapel Hill, NC graduating in 2001. After graduation Jay joined his Dad’s practice in Charlottesville subsequently purchasing the practice from him in March of 2004. Dr. John Knight continued to work with Jay and the team there until his passing in May of 2012. In December of 2009 Dr. Knight opened Spring Creek Family Dentistry & Orthodontics located at Zion Crossroads, VA at the intersection of I-64 and VA route #15. The practice there serves the communities of Louisa, Fluvanna, Orange, Goochland and Albemarle Counties. Jay is married and he and his wife Wanda have 4 children and between them, 5 grandchildren. 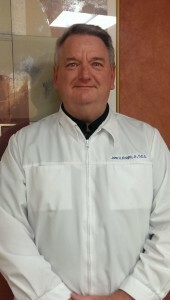 Dr. Nadeau joined our practice in June of 2014. He is a 2009 graduate of the University of Virginia where he received his BA in Biology. After graduating from UVA Dr. Nadeau entered the dental program at Virginia Commonwealth School of Dentistry (VCU) in Richmond Virginia graduating in 2013. After graduation form VCU, Dr. Nadeau completed a general practice residency (GPR) program at the Veteran’s Affairs Medical Center in Oklahoma City, Oklahoma. He completed his GPR training and this program in 2013 and joining our team of health care professionals. Dr. Nadeau has participated in numerous community service and volunteer activities including: Charlottesville Free Dental Clinic, Co-founder of Global Medical and Dental Brigades while at UVA, Special Olympics volunteer, Miles for Smiles volunteer and a provider in the Oklahoma Mission of Mercy program while at the VA in Oklahoma City. Dr. Nadeau lives at Spring Creek located at Zion Crossroads. He is an avid golfer and is very passionate about UVA athletics. Dr. Nadeau works at both John H. Knight, Jr. DDS & Associates in Charlottesville as well as Spring Creek Family Dentistry & Orthodontics at Zion Crossroads. James R. Oliver, Jr. also known as Robbie, was born in Richmond, Virginia in May of 1988. He spent much of his childhood in Amelia county before moving to Midlothian and finally across the river to Henrico where he attended Collegiate School. Upon graduation in 2007, Robbie attended Hampden-Sydney College in Farmville. He graduated in 2011 with a Bachelor’s in biology and a Minor in Chemistry. Robbie returned to Richmond working with PPD, a pharmaceutical contractor. 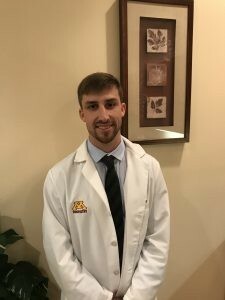 After 2 years he was accepted and attended the University of Minnesota School of Dentistry graduating in May 0f 2017. During dental school Robbie had the opportunity to experience dentistry across the globe spending time in both Denmark and Guatemala providing Dentistry. Dr. Oliver has always been involved in volunteer dentistry in his community. While attending Dental school he was president of the Sports Dentistry Club and his professional Dental fraternity Delta Sigma Delta. He is a current member of the American Dental Association, Virginia Dental Association and the Richmond Dental Society. Dr. Oliver is an avid outdoorsman who loves to hunt, fish, kayak, camp, golf and much more. He loves travelling, concerts and gardening. His black lab, Chatham, accompanies him on almost every adventure. 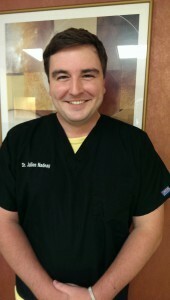 He has a very positive, caring and humble personality and loves getting to know his patient’s.